Abstract: The presence of even small amounts of elemental sulfur in natural gas is known to seriously affect the distribution lines. Just as dry solid, sulfur will accumulate in valves and, fittings, but in the presence of moisture it will be very reactive causing corrosion problems, increasing the costs of maintenance and the risk of safety issues. Now, if the sulfur gets throughout the system and to the final user, the environmental and health problems can be very serious indeed. Just the sulfur fumes can cause irritation of the eyes, nose and respiratory tract. In the presence of O2, elemental sulfur turns easily into SO2 which can cause vascular damage in the brain, heart and kidneys, enzyme system misbalance and so forth. So, it is clear the importance of finding a way to detect and quantify elemental sulfur in the natural gas. Last year we presented a new approach to fulfill this need. 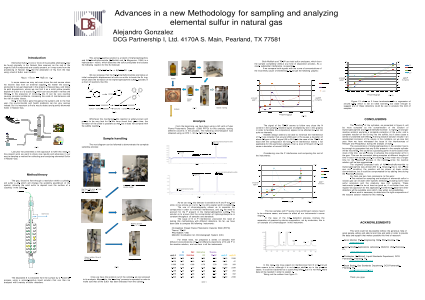 In the present work we want to share new results and advances in our way to develop a method for collecting and analyzing elemental sulfur in natural gas.